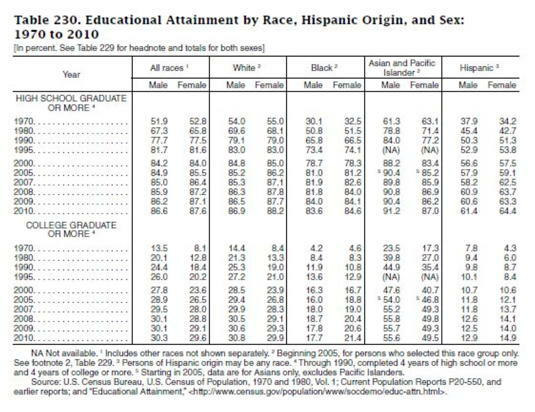 Educational Attainment and Racial, Ethnic and Gender Disparities in the U.S. The U.S. Census Bureau defines educational attainment as the highest level of education that a person has completed. Large disparities in educational attainment continue to exist among racial and ethnic groups. The gender gap in educational attainment, however, has been undergoing a dramatic social shift in recent decades. In Table 230 below, the U.S. Census Bureau tabulated these trends among Whites, Blacks, Asians and Pacific Islanders, and Hispanics between 1970 and 2010. This case study focuses only on college graduates. The data for "College graduate or more" represent the percentage of adults aged 25 years and older that obtained a degree from regular four-year colleges and universities and graduate or professional schools in each racial and ethnic group. “White” refers to persons having origins in any of the original peoples of Europe, the Middle East, or North Africa. “Black” refers to persons having origins in any of the Black racial groups of Africa. “Asian” refers to persons having origins in any of the original peoples of the Far East, Southeast Asia, or the Indian subcontinent. “Pacific Islander” refers to persons having origins in any of the original peoples of the Pacific Islands, such as Hawaii, Guam, Samoa, and Tonga. “Hispanic” refers to an ethnic group comprised of persons of any race who are of Cuban, Mexican, Puerto Rican, South or Central American, or other Spanish culture or origin. Educational attainment is strongly associated with future employment, income, and health status. How has the percentage of college graduates changed over time between 1970 and 2010 among the racial and ethnic groups and between the genders within each group? How might we illustrate these changes graphically? Beginning with the 2000 U.S. Census, respondents were given the option of selecting more than one race category to indicate their racial identities. Therefore, data on race from 2000 and beyond are not directly comparable with earlier censuses. The data in Table 230 represent persons who selected only one race category and exclude persons who selected more than one race. In the 2005 U.S. Census and beyond, the “Asian and Pacific Islander” category was split into two separate categories, “Asian” and “Native Hawaiian or Other Pacific Islander.” There were several reasons for the split. The combined category was not a homogeneous group because it put together peoples with few social or cultural similarities and who are dissimilar on important demographic characteristics. For example, in 1990, about 11 percent of Pacific Islanders aged 25 years and older obtained a bachelor’s degree compared with about 40 percent of Asians. Since Pacific Islanders are numerically a smaller group than Asians (in 2010, there were about a half million Pacific Islanders versus about 14.6 million Asians), not including them in the data of Table 230 starting in 2005 biases the percentage of college graduates upwards somewhat, but not strongly. U.S. Census Bureau, Statistical Abstract of the United States: 2012. Section 4. Education, 143-151. Telfair, J., Shelton, T. L. (2012). Educational attainment as a social determinant of health. North Carolina Medical Journal, 73(5), 358-365. How does the Census Bureau ask about educational attainment? Please use the Excel file of Table 230 provided at the end of the case study to perform the exercises. The data in Table 230 are percentages. Using Excel, create a line graph showing the trends in percentage of male college graduates and in percentage of female college graduates from 1970 through 2010 for each of the racial and ethnic groups. Create only one graph to facilitate comparisons among groups. Use only the decade years. Label the X and Y axes. Why are we using only decade years in the graph? Which racial or ethnic group had the greatest rate of increase in percentage of college graduates between 1970 and 2010? How can you tell from the graph? Which racial or ethnic group made the least progress in educational attainment between 1970 and 2010? How can you tell from the graph? Compare the gender trends within each racial and ethnic group. Using Excel, construct a bar chart showing the percentage increase in the percentage of college graduates from 1970 to 2010 by gender for each of the racial and ethnic groups. To calculate the percentage increase, use the formula [(2010 value – 1970 value) / (1970 value)] X 100. Which racial or ethnic group had the largest percentage increase in the percentage of college graduates since 1970? Which gender for which racial or ethnic group had the smallest percentage increase in the percentage of college graduates since 1970? What might be impeding their progress? Using Excel, construct a bar chart comparing the gender gap (i.e., percentage of male college graduates minus percentage of female college graduates) in 1970 to the gender gap in 2010 for each of the racial and ethnic groups. 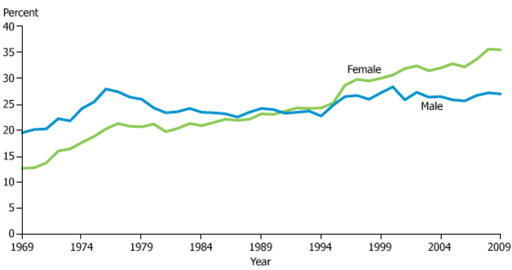 Overall, what is the trend in the gender gap in educational attainment from 1970 to 2010? In which group is this trend already evident in 1970? In which group has the gender gap reversed? In which group has the gender gap stayed approximately the same in both years? Why do you think this is so? How does one reconcile the data shown in Table 230 with the statistics shown in the graph below indicating that the percentage of young women graduating from college far exceeds the percentage of young men graduating from college in 2009? What are some of the societal factors propelling women to achieve higher educational degrees?